Earlier this month, I celebrated my (25th!!?? how did that happen) birthday. As part of my present, my dad took me to a knife skills class at Williams Sonoma. It was a ton of fun and I really enjoyed spending time with him. This class is definitely not something he would have done on his own. This is one of the recipes that we made that night. It was totally delicious, and I had been thinking about it ever since I took the class. I made a few modifications to the recipe that they handed out to us in the end, but the same great flavor was there. The recipe calls for dried cherries, but when we got to the end of class, we realized that we had used cherry flavored dried cranberries. Oops. That's what I used in this recipe, even though I'm keeping the name. 2. Cut a slice in one long side of the chicken, being careful not to slice all the way through. You are basically creating a pocket in the chicken. 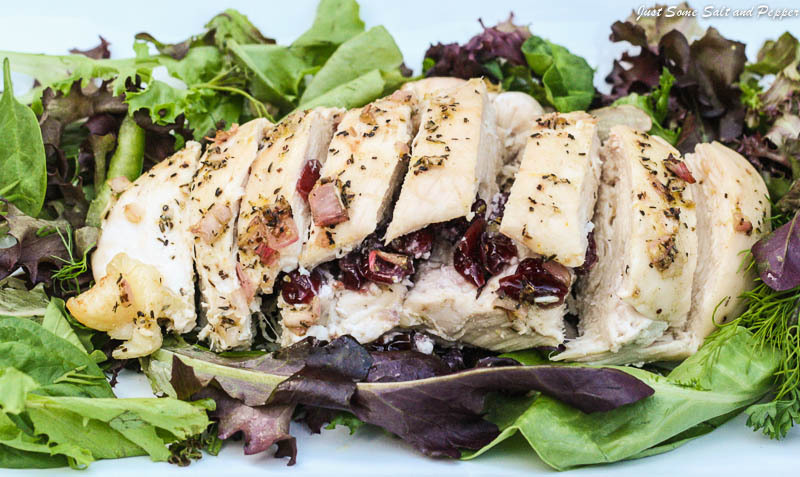 Stuff each chicken with an equal amount of dried cranberries. Place in a medium sized baking dish and set aside. 3. In a medium bowl, stir together the rest of the ingredients and pour over the chicken. Marinate in the refrigerator for at least two hours and up to 24 hours. 4. Bake for 35-40 minute, or until the chicken is no longer pink. Serve with the juices in the dish spooned over the chicken. Yummy in my tummy. Thanks so much for stopping by Granny's Down Home Sassy Southern Cooking and your yummy comment. I LOVE anything stuffed haha. So dried cherry (or cranberry haha) stuffed chicken sounds perfect. I love cooking and baking with dried cranberries and cherries, they have such a nice tart/sweet flavor. This looks like something I would really like! That is such a fun present!! I'm definitely requesting something like that for my next birthday. Super cool. Aaahhhh, I'm going to be 25 at the end of the year. This recipe sounds great for fall! Dried fruit with meat is always a very tasty combination. What a tasty and creative way to make chicken more special. This looks and sounds so delicious! I think it's so so cute that your dad took you to a class as your gift~I think sometimes those "quality time" presents are the best. :D My husband when he was my bf, sent me off to a gourmet cupcake class as a gift, hehe. That sounds wonderful, I love cooking classes especially as gifts! The chicken looks delicious. The only reason I would love to go to cooking class is because of the knife skills lessons! Wonderful flavors, very unique! I love the idea of taking a class with my dad--that's an awesome birthday gift. Making memories by doing something together, and learning some lifelong skills while doing that, is a winning combination. Add a tasty recipe and it's sprinkles and cherries on top of the whipped cream, you know? I *do* have dried cherries, and I look forward to trying this. This chicken looks delish! I live for those classes at Williams-Sonoma or the Viking Store. I get really giddy everytime. What a sweet gift from your dad. 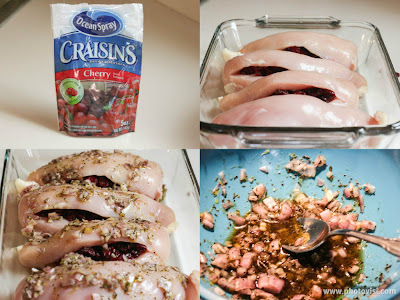 I can't wait to make this, but I'll use dried cherries. I really don't like dried cranberries! Chicken recipes always inspire me like this one. 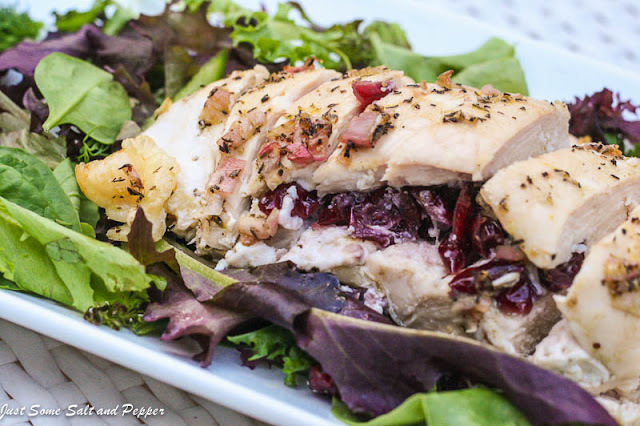 This looks really good, I love the combo of chicken and cranberry so I will definitely have to try to whip this up. Thanks for sharing.